By linking on the website detailed below, you can search through the Roll of Honour for Buckinghamshire. It gives detailed information for the fallen in The Great War and World War II whose names are inscribed on our memorials. It was compiled by Martin Edwards in 2003. He writes of the Olney cenotaph memorial in the market square: "There are 64 men from World War 1 commemorated and 19 men from World War 2. The memorial was unveiled by General Lord Horne of Stirkoke on 1st May 1921." Colin Macknezie's 'The Name on The Olney War Memorial 1939-1945" provides another reference. 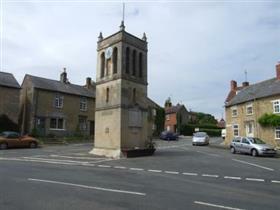 Of the Emberton clock tower: "The memorial takes the form of lists of those who served and survived and those who died. The lists of survivors flanks that of those who died. In the church nearby is a chapel area dedicated to those who fell in the wars". In Clifton Reynes "The war memorial is in the form of a screen within the church. Each panel contains part of the memorial inscription and the names". In Weston Underwood the war memorials "consist of several individual plaques on the wall of the church". They are inscribed "Their name liveth for evermore. In proud and honoured memory of the men of this village who at the call of duty gave their lives in defence of their King and country during the Great War. 1914-1918". The site also links to 'Buckinghamshire Remembers'.